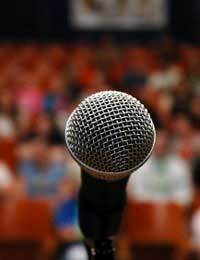 Agreeing to be a guest speaker means that someone gives up the time to speak for an audience as well the time required to write and plan a speech. Even if a guest speaker is being paid or otherwise compensated for his or her speech, sending a thank you letter helps to maintain good relationships and would be proper business etiquette. Thank you letters to guest speakers should always contain a message of thanks for delivering a speech or presentation. Generally these letters will reference the content of the speech or presentation, or the flair with which it was delivered, but if the guest speaker was relatively unsuccessful then it might be better to simply discuss how nice it was for him or her to be the guest speaker and how important the general topic was to the audience. If the guest speaker was presenting as part of a programme of talks or lectures then reference the programme or series as a whole is also a good idea. A thank you letter may be formal if it is being sent on behalf of an organisation or informal if it is from a closer individual. Formal letters should be formatted as business letters with the titles and address of both the writer and recipient present. Informal letters do not need to include these details. Formal letters should contain formal salutations and closings, while informal letters can use a wide variety of greetings and closings. Formal letters should be types and printed on company or organisation letterhead while informal letters should be handwritten on nice paper or card. Electronic communications should not be used for thank you letters for guest speakers. On behalf of the Sociology Department of Big University I would like to thank you for taking part in our Summer Lecture Series. This Series has been in existence for over 100 years and it is because of dedicated academics such as yourself that it still continues to be such a success. Your talk on "An Interesting Sociological Theory" was the most well attended of the Series and our faculty, staff and students are still talking about it. It was an honour for the Big University community to be able to hear your ideas. If you've found this thank you letter useful and have some other events coming up why not check out our thank you letters on Thank You Letter for Hosting a Fundraising Event or Thank You Letter to Event Sponsors. I want to sent a thank you letter to an instructor who gave an outstanding lecture. In this case a handwritten letter, along with a small gift, is the perfect gesture of appreciation, especially if the person has volunteered his services (if paid, omit the gift). The handwritten makes it more personal and warmer – typed is far more formal and you want to convey sincerity for the person giving their time in this instance.